Within the boberdoo call routing system, you have the ability to build your own custom IVR and attach it to any phone campaign. The data from this IVR can then be used to intelligently route calls to your network of buyers. 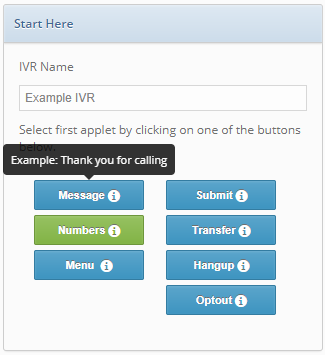 From your boberdoo lead distribution system, go to Phone Routing>IVR Manger (VoIP2) and click Add New IVR. Next, construct your IVR step by step using the options provided. You can play a custom message, prompt the caller to enter their zip code, or even walk them through a multi-step menu. Hover over each icon to learn exactly what each option is used for. Message: The message option plays an audio message for the caller. This message can be automatically voiced via our Text-to-voice technology or you can utilize an existing MP3 file. A Message may be utilized at any point of your IVR, whether its for an initial greeting, menu transition or exit message. Numbers: The numbers option requires the user to input a set of numbers to be submitted. This is typically used when asking a user to provide their zip code. When using this option, you’ll be asked to map the number inputted by the user to a field in your lead type. Menu: The menu option presents the user with multiple options and allows them to advance through questions by entering a number on their key pad. For example: Press 1 for roofing. Press 2 for windows. With this option, you’ll be asked to associate a field for your menu item. This field can carry a different value, depending on the response of the user. If your menu prompt is, “Please select a project type,” your field would be Project. Your field values would be 1 for roofing and 2 for windows. As you build your IVR, each additional step is added as a new column. Within each column you have several options that allow you to customize your IVR and the outcomes based on the user’s inputs. Before you can finish your IVR, you need to add an Exit Action that instructs the system what to do with the call based on the response from the user. Submit: This option completes the IVR portion of the call, gathers all data collected and routes the call to your network of buyers accordingly. Hangup: This option ends the current call and does not route it to your network of buyers. There are dozens of different ways to construct an IVR. As an example of an existing IVR, watch the video below. This video demonstrates how we built the IVR used for boberdoo’s main phone line: 800-776-5646. If you have any additional questions regarding the IVR Manager, feel free to contact us. At boberdoo, we have been building lead distribution systems for well over a decade. Because our lead distribution system is detailed and built to service the needs of all of our clients, we compiled a video library to help walk you through many of our features and functions.